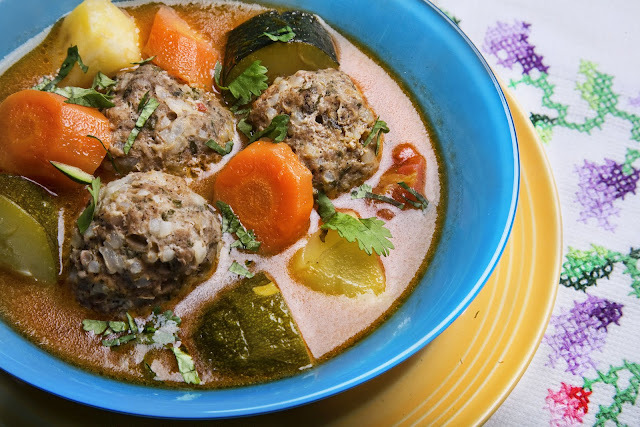 Cold days get me thinking about childhood comfort food: Albondigas! Growing up in a home where food was at the center of most family functions, I have a lot of memories associated with food. Christmas: tamales. Easter: honey baked ham with fresh from scratch biscuits. Thanksgiving: two turkeys - one roasted in the oven, the other in the barbecue. Cold days was albondigas (Mexican meatball soap) or posolé, Mexican hot chocolate with fresh virotes for dunking (also known as bolillos, a crusty savory bread much like french bread). Night time warm-me ups was Mexican rice pudding with lots of cinnamon and Bordens condensed milk. All of us girls had our favorite birthday food as well. Mine was the same as my Auntie Syl's: my dad's homemade meat lovers lasagna. My sisters favs ranged from beef stew to hoggies to carne asada to carnitas. And there is just so much more that will just need to wait for another post. So, on to today's food memory: albondigas! There was nothing like coming home from school on a cold wintery day to the smell of the mint scented soup filling up the house. Mom and Dad made it but with slight variations - no measuring after all - and each palate is different. But it was always good eats no matter who made it. For the last several weeks, I've been taking my youngest sister, who is temporarily without a vehicle, to work in the mornings. Inevitably we get to talking about food as she's a foodie as well and, I'm discovering, becoming quite the cook. She recently rang my dad up and asked him how to make albondigas. She relayed the recipe to me last Saturday as I drove her to work and I've been thinking about it this entire time. Must have some! My soup is a bit different from my dad's. I've had it out at a restaurant in Oldtown San Diego and loved it so my recipe is a little bit of dad and a little bit of what I remember from Oldtown Mexican Cafe. Dad doesn't add tomatoes and the veggies are just the potatoes and carrots. He also prefers dried mint to the fresh (mint is what gives albondigas it's distinctive flavor) and I believe he uses more oregano than I did. I love Dads soup. It's completely authentic, yummy and made with so much love. Mine is a little different but in my opinion, gives Pop's a run for his money. Of course, I would never say that to him! Heat up a stock pot. Pour olive oil to cover bottom of pot. 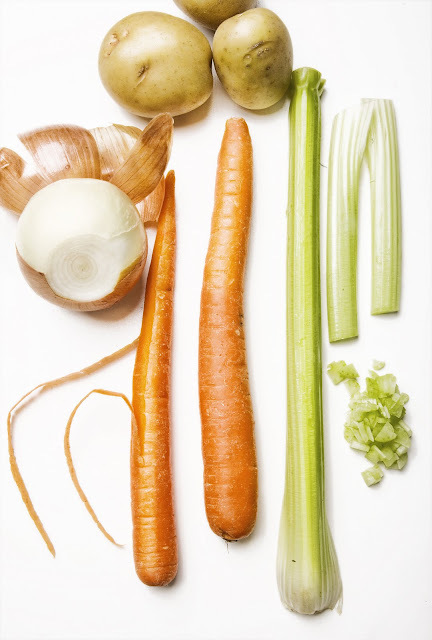 Add onions, celery and garlic. Stir to sweat not brown. Add tomatoes (including liquid). Use the back of a wooden spoon to break up the tomatoes. Add the water and bring to a simmer. Add bouillon and chili powder. Simmer. After 5 min, taste and add more bouillon to taste (I find 4 tbs to be enough but sometimes I'll add an additional teaspoon). While broth is simmering, place meat into a large bowl. Add rice, mint, oregano, parsley, cumin, black pepper and eggs. Using your hands, gently incorporate all the ingredients. Try not to overwork so you don't toughen up the meat by compacting it too much. Roll about 2 tbs of the meat in your hands to form a meatball (should be no bigger than a golf ball). 2 lbs of meat yielded me 26 meatballs. Once all the meatballs are formed, slowly drop them into the simmer broth. Cover pot. Next, peel and cube the potatoes. My family usually uses russets. I happened to have Yukons so that's what I used this time but I definitely recommend the russets as the hold up better. Don't cube them too small. You want them to be about an inch or so. Set aside. After the meatballs have simmered for about 20 minutes, add the potatoes and carrots. Continue to simmer for an additional 15 minutes. Then add the zucchini and simmer for 10 more minutes or until the vegetables are fork tender. Serve hot and garnish (optional) with fresh chopped cilantro. I love albondigas but have only had restaurant versions of it. Now that you've posted a recipe, I will definitely have to give it a try.